1. 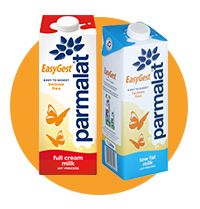 If my child has a milk allergy, can he/she drink Parmalat EasyGest Milk? A child with a milk allergy is allergic to the protein in cow’s milk. Parmalat EasyGest is still regular cow’s milk and, although is lactose-free, still contains the proteins. A child that is allergic to cow’s milk can therefore not drink Parmalat EasyGest. 2. From what age can a person drink Parmalat EasyGest Milk? From 12 months old, anyone can drink Parmalat Easygest. 3. How is the lactose removed from Parmalat Easygest milk? The lactase enzyme is added to the milk in order to break down the lactose molecules into glucose and galactose molecules. This changes the taste of the milk and makes it sweeter, but doesn’t affect the nutritional value of the milk in any way. 4. Where can I buy Parmalat Easygest? 5. Where do I find Parmalat EasyGest in the store?